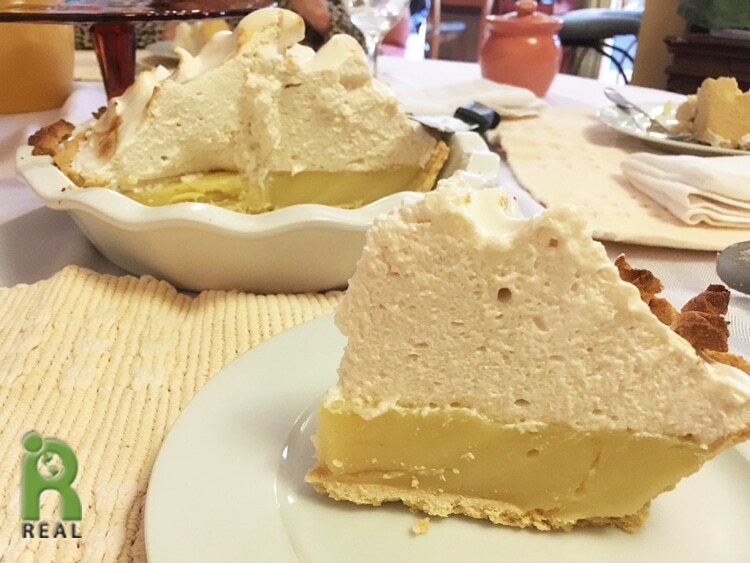 We paired our Gluten-Free Crust with Zsu Dever‘s Lemon Custard and Aquafaba Meringue for a perfect pie. It’s amazing! This is REAL meringue without using egg whites. We highly recommend getting her Aquafaba cookbook for all the details about making Aquafaba meringue and a lot more. We made our Aquafaba from cooking chickpeas in water and then reducing the remaining bean water to a thick liquid. The Aquafaba cookbook goes into detail on how to do this. Listen to the interview with Zsu Dever to get more tips with Aquafaba. I have modified the order of some of the recipes instructions after making this recipe several times. Measure out 1 1/3 cup water ad combine 1/2 cup of it with the arrowroot or cornstarch to form a slurry; set aside. Combine the remaining 5/6 cup water and the agar in a medium saucepan and set aside for 3 minutes to soften. Blend the lemon juice, cashews and turmeric in a blender until very smooth, scraping the sides as needed; set aside to cool. Add the sugar to the agar mixture and bring it to a boil over medium heat, stirring occasionally. Cook the mixture 5 minutes to completely dissolve the agar. Add the lemon mixture and return to a simmer. Add the starch slurry and return to a simmer. gently stir the mixture and cook for 30 seconds. Remove the filling from the heat and stir in the butter. Set the filling aside to cool. When the filling is warm, not hot, pour into the baked pie shell. I recommend starting the Sugar Syrup for the meringue before beating the aquafaba. Sugar Syrup: Add the 1/2 cup water and agar to a heavy-bottomed medium saucepan. Set aside to soften for 3 minutes Add 1/4 teaspoon cream of tartar and the remaining 1 cup sugar to the water. Bring the mixture to a boil, stirring constantly to melt the sugar (this will take a few minutes), over medium-heat. Remove the lid, wash the sides of the pan with water and attach a candy thermometer; do not stir again. Cook the syrup until it reaches 260oF (hard-all stage). This can take some time. When the syrup reaches 260oF, turn off the heat and allow it to set a few minutes until it is no longer bubbling; do not move or jiggle the pan until then. Whipping the Aquafaba: Add the aquafaba and 1/2 teaspoon of the cream of tartar to the bowl of a stand mixer. Using a whisk, whip the aquafaba for 10 seconds. Using a balloon whip attachment, whip the aquafaba on medium power for 5 minutes. Increase the speed to medium-high and continue to whip for another 5 minutes, or until the aquafaba can hold stiff peaks. This sometimes takes around 20-30 minutes. Once the meringue is ready, keep whipping it until ready to add the sugar syrup. Then slow the machine and add the sugar syrup in a steady stream, trying not to touch the sides of the bowl or the whisk. Once all the syrup has been added, increase the speed to medium-high for 4 minutes or more until the meringue is much cooler. Here we are streaming in the sugar syrup into the Aquafaba Meringue. Spread the meringue on the still-warm filling, spreading it to the edges of the crust to reduce shrinking. Next we pile it on the Lemon Custard. It was so much fun! Cool the pie completely overnight before browning the meringue with a pastry torch or under a broil. 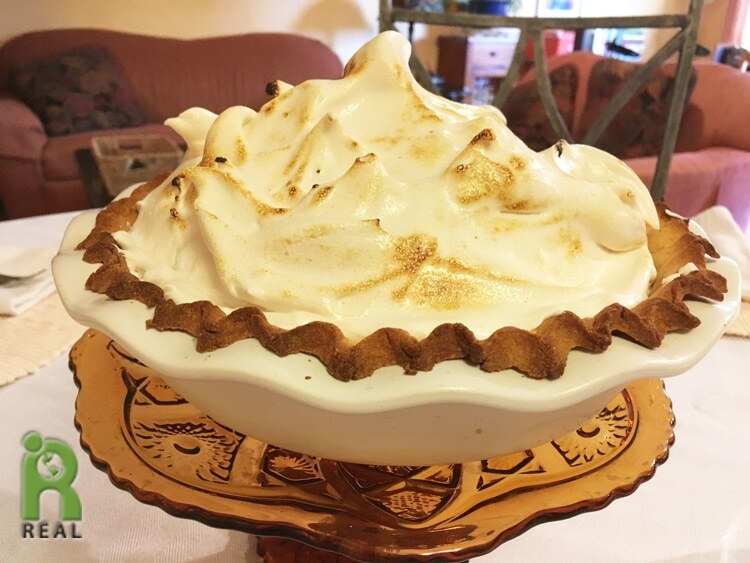 If using a broiler, turn the pie every 10 seconds until browns, 1 to 2 minutes, to even brown the meringue.